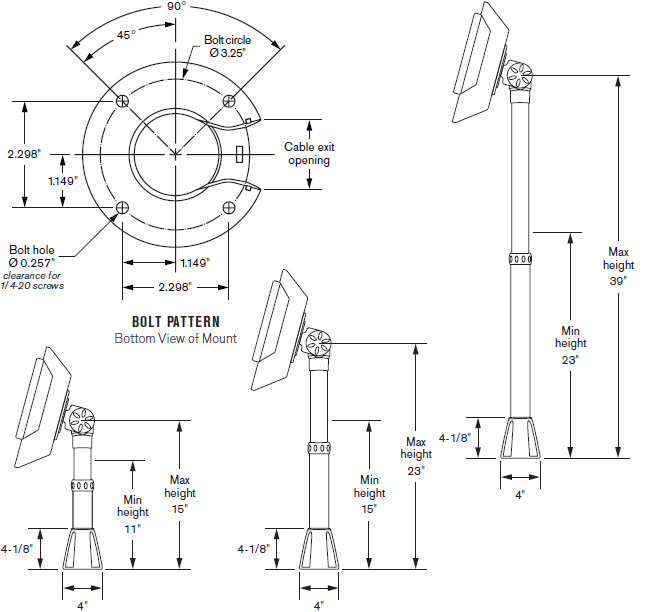 Pole height range by model: 11"-15", 15"-23", 23"-39"
Looking for mount that passes through counter? Designed for high-traffic retail environments, Innovative 9183-15 enables monitor height to be adjusted between 11" and 15". 9183-23 enables monitor height to be adjusted between 15" and 23". 9183-39 enables monitor height to be adjusted between 23" and 39". This countertop point-of-sale mounting solution includes an internal cable management system and through counter mount. Retail environments require retail-ready solutions. Our adjustable countertop POS mount features easy height adjustment, an attractive appearance, internal cable management, and durable construction - all at an appealing price point! The monitor may be pivoted or turned to suit the user's needs (or may be locked in position if you don't wish to allow adjustment). Height is adjusted via an integrated knob on the tube. Cables are kept entirely out of view (and out of harm's way) - they may either pass through the counter or exit behind the mount. Question: Does the base detach from the pole? Basically, I need to trim the pole to be a bit shorter. Answer: Yes, you can remove the pole from the mount and trim the pole, if needed. Please be advised that your warranty will be annulled, once you cut the pole. Height Range 9183-15: 11"-15", 9183-23: 15"-23", 9183-39: 23"-39"